When editing cues or groups you can now easily edit the contents of any pre defined matrix. The Matrix tab shown above will appear if any matrices have been defined in the software. The two dimensional grid will show a representation of the matrix definition. You can then paint to the matrix in any colour or map any image from your system. If the channels connected to the matrix cell do not exists in the cue they will be automatically added as soon as you paint to it. 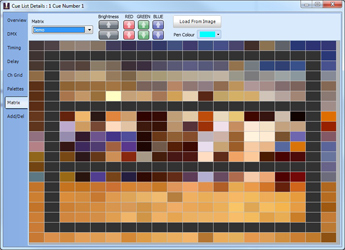 Additional controls allow you to tweak the brightness, red, green or blue content of the matrix. As with the blind editing of cues or groups editing of chase steps for large arrays of fixtures is made easer with the new matrix display. In the top left of the chase step editor is a button to switch between the traditional channel view or a matrix view. As with the blind cue and group editor channels can be added or modified by simply painting into cells in your selected colour. Images can also be overlayed onto the matrix. A new action type has been added when setting up MIDI note events. Setting the Action to command will allow for any command line macro to be written directly to the trigger. When the MIDI event fires the command set will be executed. For more complex control change mapping LightFactory now support an arbitrary list of control change events similar to the MIDI note and velocity messages. Each control change event can set a submaster, fire a shortcut or execute a command line macro. To help with mapping MIDI messages to various triggers in LigtFactory the MIDI learn screen can be used. This window will step you through creating of a MIDI event using your MIDI hardware. Simply press the "START LEARNING" button and then press or move the MIDI control on your physical device. The software will prompt you to assign the control to either a shortcut, submaster, cue go or run a simple macro. To make patching fixtures easier you can now use the "auto patch" button. This will patch the selected fixture to the next available desk channel and dimmer slot.